MIIS students ask tough questions to world leaders…and get answers. Making new friends in Peru! Anna Galbraith is a third-semester, IEM student currently completing her practicum with the Andean Alliance in the beautiful Sacred Valley of Peru. We spoke with her recently to see what she has been up to and how her experience at MIIS prepared her for this new opportunity. Why did you choose the IEM program at MIIS? Choosing the IEM program at MIIS was basically a no-brainer. I had been living in Spain teaching English but wanted to transition into something different in the States, something still related to international education but outside of the teaching role. The IEM program valued all of the skills I had learned abroad, but gave me a chance to learn the necessary skills to enter into the field as a manager. Honestly, it was the best decision I’ve ever made. I got to spend a year in beautiful Monterey with an amazing cohort; learn from passionate, caring professors; and build my resume with on-campus work (as a GA in Recruiting, and as the Spanish tutor/activity coordinator for SILP). And now I find myself in the Sacred Valley of Peru, starting my practicum with the Andean Alliance for Sustainable Development! How did you find your practicum opportunity? What was your strategy? My practicum search/decision was pretty seamless. I had worked previously with the organization in Marketing and Recruiting, and fell in love with the organization and their mission. I chose to work with them again in Design and Assessment. During that time I was able to communicate quite a bit with their previous intern, IEM alum JoLyn Rekasis, who had nothing but great things to say about her experience. 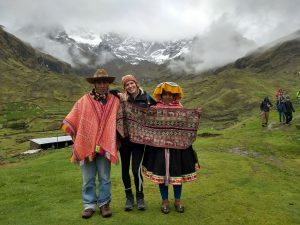 My goals for practicum were to find a place where I could continue using Spanish (preferably in Latin America), to learn more about service learning, and to be able to try out a variety of responsibilities. The Andean Alliance checked all of the boxes. Tell me about an incident where your Intercultural Competence (ICC) skills were challenged. Considering it’s my first time in Latin America, my ICC skills are being tested on a daily basis! I’m also living with a host family, who is absolutely wonderful, but that experience comes with its own little challenges as well. I’m working on questioning my own biases and am finding it interesting to plot my journey on the Developmental Model of Intercultural Sensitivity (nerdy, I know!). Some minor bumps in the road have been learning how to haggle, which I’m terrible at, and trying to look at guinea pigs as a nutritious, sustainable food source, instead of as adorable pets. What are some unanticipated challenges you’ve faced so far in your new position? Considering I knew the organization really well before coming, I wasn’t thrown too many curveballs upon arrival. However, navigating the differences in vocabulary between Spain and Peru has been a fun (read: frustrating) endeavor! That and the prevalence of Quechua makes me feel like I’m learning Spanish all over again. What is one thing you’ve learned on the job? I can’t believe I’m saying this, but I’ve learned that theories of change and program logic models should be fundamental aspects of any organization, which is what they told us in Design and Assessment but which I had secretly hoped was an exaggeration (sorry for doubting you, professors!!). What has been one highlight of your time abroad so far? I arrived to Peru just in time to help the Andean Alliance host MIIS and Middlebury College students for J-term. It was exhilarating to experience a program right away and a pleasure to work with such a talented group. We even went to Machu Picchu together, which was an experience I’ll never forget! Ana enjoying the sites at Macchu Picchu. What advice do you have for any future IEM practicum students in regards to class choices, internship opportunities, or the IEM field in general? My advice would be to try out as many different classes and opportunities while on campus as possible, as that was the best way for me to determine what excited me and what didn’t. Definitely use the classes with learning partners as a way to become acquainted with the opportunities available. I also suggest taking an honest look at your own gaps in knowledge and taking advantage of the resources on campus to fill them (I’m looking at you, Excel workshops!). When it comes to practicum, go with your gut, and take into account your own personal goals as well as educational/professional ones. Oh, and while you’re in Monterey, take advantage of all of the natural beauty that the area has to offer. Sunset study breaks are ALWAYS a good idea. Thank you for sharing your experience with us Anna. We wish you continued success! To learn more about the IEM program or if you have questions about practicum, please contact iempracticum@miis.edu or view us online. Great interview! 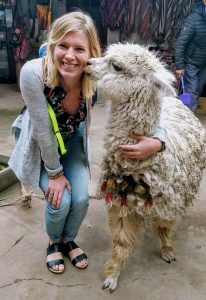 So wonderful to hear how things are going in Peru, Anna. Glad all those logic model and excel sessions actually do come in handy in the real world after all! =) We miss seeing you in Monterey, but are glad to see you out there putting your knowledge and skills into practice with AASD. Keep in touch!